Through her work with the Brighter Days Food Pantry in Leander, Terri Sue has helped serve over 195,000 meals to more than 34,000 people – and counting! For many years, Terri Sue Bettis has served her Leander community in roles ranging from volunteer to leader, from homeschool teacher to board member to director. Throughout it all, one thing has remained the same – her strong belief that she is called to serve her neighbors. 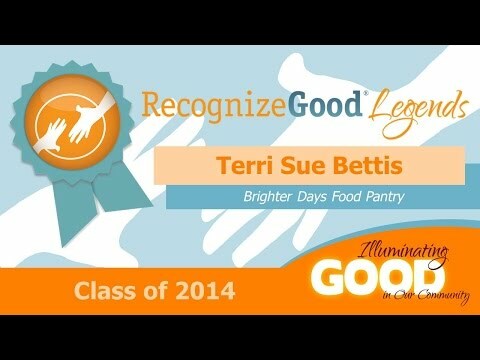 Led by Terri Sue for the past three years, the Brighter Days Food Pantry has served an estimated 195,000 meals to over 34,000 people – in a town of less than thirty thousand people. Terri Sue’s true impact may be measured more appropriately by that empowering effect on fellow volunteers than by her own dedication. In addition to her time with the Brighter Days Food Pantry, Terri Sue has donated her time and talents as a volunteer for the Navy Relief Society, a volunteer ombudsman for the USS Lincoln, board member and co-director for the Eagles Homeschool Group, founder of homeschool-training nonprofit organization Counting the Cost, and director of Higher Ground Ministries. Ezra says, “She has worked tirelessly to expand our pantry by partnering with grocery stores and other retail outlets. Her goal is that we always have enough food for everyone who needs assistance and so far her goal has been met. To find such constant striving to improve in a volunteer is rare, especially when the only true rewards are spiritual.